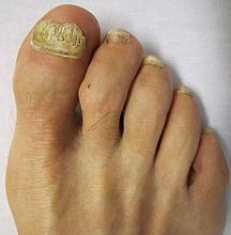 Onychomycosis (also known as “dermatophytic onychomycosis,” and “ringworm of the nail,” is a fungal infection of the nail. It is the most common disease of the nails and constitutes about 50% of all nail abnormalities. This condition is not only painful and embarrassing; it can also lead to a dangerous complications especially with diabetes or a suppressed immune system. 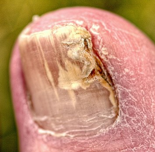 Fungi, including yeasts and molds, are the typical cause of nail infections, and most of these infections are caused by a group of fungi called dermatophytes. These fungi can live in the layer of dead skin around your nails, in the space under your nail, and in the nail itself.